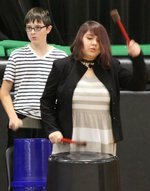 Research has shown that bucket drumming is a beneficial addition to the music curriculum. Besides improving coordination, it benefits students emotionally, socially, and cognitively. It enhances creativity and expression while stimulating both hemispheres of the brain simultaneously. This stimulation is a rare experience! Additionally, bucket drumming encourages higher-order thinking and boosts self-esteem.